We are excited to present you with this fresh cranberry relish recipe! A truly refreshing and light compliment to the standard heavy thanksgiving fare. We’re all familiar with the different types of cranberry dishes you’ll find at the thanksgiving dinner table right? You’ve got the thick jello log thing that comes directly out of a can, just slice and serve. Then you’ve got the Aunt that is always raving about her amazing cranberry relish. Needless to say she just threw a few chopped up cranberries in a bag of white sugar and presents it as a “light and healthy” side. These options are neither tasty nor keto friendly, but don’t worry, we got you! In preparation for this holiday season Megha and I did extensive research on what was currently offered as keto thanksgiving options. We kept stumbling upon cranberry dishes that we’re lower carb than a traditional relish, but were far from actual keto options. So we set out to get this thing as low carb as possible while still being delicious, and I think we’ve accomplished that! What’s different about our fresh cranberry relish? Well instead of using orange juice and orange zest we’re using apple cider vinegar and lime zest! This dramatically cuts the carbs and sugar from the dish, while still giving a nice subtle sweetness from the apple cider vinegar. 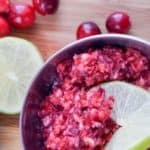 This fresh cranberry relish is simple to whip up too! All you do is throw everything in a food processor and press the button. I wish I could tell you there was some ingenious technique we discovered here. The truth is we just combined a few simple, fresh ingredients to make a tasty cranberry relish. The sweetness of this dish is up to you. We’ve made it using liquid stevia drops as well as erythritol. Out of those 2 we preferred erythritol, but neither is required. Most standard cranberry dishes rely heavily on sugar, so you may find this dish quite tart if you do not sweeten it. Our taste buds are adjusted to a lack of sugar now so we really like this relish without any sweeteners. The good news is you can make this fresh cranberry relish without any sweetener and then add it later if you think it needs it. Combine all ingredients in a food processor. Pulse until cranberries are evenly chopped. Enjoy!